Undoubtedly the most convenient way of traveling to Lochcarron is by car. 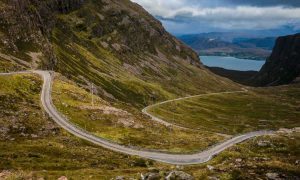 Inverness (circa 60 miles) or Fort William (circa 80 miles) are the most popular routes, although you can drive down the spectacular coast road from Ullapool (circa 100 miles). 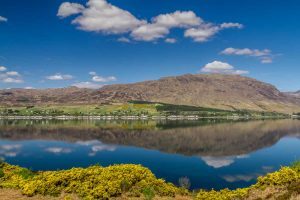 Things to do in and around Lochcarron. The region is a hillwalking mecca with many Munros (mountains over 3000 feet) and Corbetts (mountains between 2500 and 3000 feet) within easy driving distance. The Torridon and Applecross mountains are both high, spectacular and challenging. However, for those that prefer their walking at a lower level there are many options and a walking guide is available to purchase locally that outlines suitable walks, both high and low level, in the area. Apart from walking and climbing, you can hire bikes, canoes and small boats locally. If you like a round of golf the local 9 hole course makes visitors very welcome. For garden lovers, Attadale is close by and while it’s a longer drive Inverewe Gardens is also within striking distance. Many companies provide boat trips in the area, offering the opportunity to view sea and bird life at close quarters. Depending on the time of year you can view puffins, eagles, dolphins, seals and much more – check with individual operators for times and what you might find. Driving tours are popular with the less energetic, or with those who just want a day off from their exertions! Routes are easily devised that can take in Skye to the south or many of the sea lochs and mountain regions to the north. The scenery is spectacular and with quiet roads there is never the feeling of being rushed – take your time and enjoy the view. A full day tour to the north could include Torridon, Kinlochewe, Gairloch via Loch Maree and on to Poolewe. From there you can head further north up to Little Loch Broom before the road heads south again picking up the A835 south to the junction with the A382, which brings you nicely back into Lochcarron. Don’t forget to stop and drink in the views or perhaps for lunch in one of the villages along the coast road – seafood is a speciality in this area. Skye is a popular destination. The road to Strathcarron meanders along the south side of Loch Carron and eventually meets the A87 for Skye, although there is much to stop and see on the way. You may wish to take a short detour and visit the wonderful Eilean Donan Castle, one of the most picturesque castles in Scotland. Skye offers many attractions including distillery tours, castles, heritage visitor centres and of course the dramatic Cuillin mountain range. If you would prefer less time in the car, shorter tours can be created easily, just pick up a map and plot your route. Maybe head for Kishorn and the Applecross peninsular, eventually heading north to Loch Torridon and then back south to Lochcarron – wonderful scenery all the way. Another mode of transport that shouldn’t be missed is a trip on the world famous railway line from Inverness to the Kyle of Lochalsh. There is a station at Strathcarron and the line is considered to be one of the most beautiful railway journeys in the world! Mountain and Sea Guides – walking, climbing and kayaking. Kayak rental.